What Are the Signs and Symptoms of Vyvanse Addiction? Am I Addicted to Vyvanse? Is Vyvanse Addictive? How Addictive is Vyvanse? Vyvanse was actually designed to be less addictive than some other ADHD drugs, including Ritalin and Adderall. The body breaks down this drug more slowly, which means that it's more challenging to get high from Vyvanse than from some other drugs. This doesn't mean Vyvanse is safe or non-addictive though. Any mind-altering substance can become addictive. Dependency on Vyvanse can leave you feeling lethargic, hopeless and depressed without it.In an increasingly fast-paced world, we all want more energy, more focus, and more motivation. To Vyvanse addicts, this dream can initially feel like a reality. Sadly, the rush of Vyvanse quickly gives way to an intense chemical dependency that can leave you feeling lethargic, hopeless, and depressed without the drug. Vyvanse hooks users by offering them an intense burst of energy and euphoria. Some prescription users become addicted after steadily upping their dosage, and a handful of users self-medicate with Vyvanse. Vyvanse is increasingly popular as a "performance-enhancing" drug though research suggests it may not enhance performance to a significant degree. For this reason, addiction rates are rapidly increasing among college students, particularly those at competitive schools. Using Vyvanse without a prescription, or lying to medical providers to get access to Vyvanse. Feeling depressed or agitated without Vyvanse. Taking more Vyvanse than recommended by your doctor. Prioritizing Vyvanse over your job, loved ones, health or safety. The easiest way to test yourself for addiction is to stop taking the drug for a day or two. If you don't have an addiction, this should be no problem at all. If you're an addict, you'll find quitting Vyvanse extraordinarily difficult, and perhaps even impossible. Lie to others about your use of Vyvanse. Go "doctor-shopping" to get more Vyvanse. Use Vyvanse as a performance-enhancer. Because Vyvanse is a stimulant, you may also notice an increase in anger, aggression, and hostility, as well as a surge in relationship problems. Over time, you may also find that your ability to concentrate and maintain motivation is diminished. Vyvanse tends to increase concentration and motivation, so addicts quickly grow dependent on it to experience these feelings. In some people, Vyvanse can cause intense rage, profuse sweating, and even skin-picking, so if you experience these symptoms, you need to talk to your doctor immediately. It's easy to find ways in which your symptoms don't neatly match a list of addiction symptoms. Denial is common among Vyvanse addicts, particularly those with a prescription for the drug. If you need help evaluating these signs in yourself or a loved one, know that you are not alone. Please call us today at 1-888-993-3112Who Answers? to find a suitable treatment to help you with Vyvanse addiction. It's important not to criticize or judge the one addicted to Vyvanse.If you're worried that a loved one is showing signs of addiction, know that it's not their fault. Addiction is a disease, not something people willingly choose. For this reason, it's important to avoid criticizing or judging your loved one. Instead, compassionately offer information on treatment and express your concern to the addict. If your loved one gets angry or denies his or her addiction, be prepared to set clear boundaries, such as no longer giving your loved one money for drugs. Addiction hurts the loved ones of addicts, but good boundaries can spare you some pain. 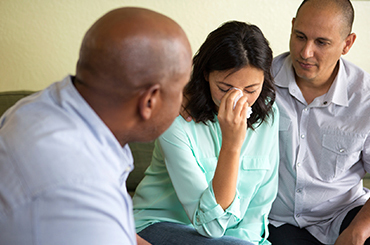 If you can't get your loved one to seek help, an intervention may do the trick. Interventions use peer pressure to make treatment seem like the best and easiest option. The process begins with loved ones who all agree about the need for treatment; if anyone doubts the severity of the addiction, don't include them since they can undermine the process. Each group member should share how the addict's behavior has affected him or her, and then plead with the addict to seek treatment. Importantly, each participant should also share what they will do if the addict refuses treatment, then follow through with these promises. An intervention should feel like a turning point even if the addict won't accept treatment, so following through is critically important. Loving a Vyvanse addict is no easy feat. Paranoia, aggression, hostile behavior, and other symptoms can be extraordinarily painful. Everyone who loves an addict struggles from time to time, and there's no shame in seeking support. A group such as Nar-Anon, which helps people who love addicts care for themselves while better understanding the disease of addiction, can help you move forward even if the addict you love is unwilling to stop using. Family therapy, particularly family systems therapy, can be especially helpful for improving your relationship with an addict. If you find that you can't seem to stop helping the addict or obsessing over his or her condition, cognitive-behavioral therapy can help rid you of these intrusive thoughts. When you're at the bottom of a Vyvanse addiction, it can be impossible to glimpse even a glimmer of hope. But millions of addicts recover each year, and you can, too. Inpatient treatment is a great option because it removes you from a stressful environment, replacing peer pressure with therapy, group support, and a host of resources. Inpatient treatment can be especially helpful if you developed an addiction after receiving a Vyvanse prescription, since inpatient facilities will help you find better and less addictive treatment options, all within the confines of a safe and supportive environment. For recovering addicts concerned about their privacy or their jobs, executive rehab offers the resources you need to keep working while steadily moving toward recovery. You don't have to move out of your home to get better, though. 12-step programs have helped millions recover, and they can help you, too. Therapy can empower you to better understand your addiction while offering you more effective coping skills. If you're concerned about how Vyvanse has affected your health or worried about how to treat ADHD without Vyvanse, your doctor can be a powerful ally on the path to sobriety. It's especially important for Vyvanse users to find treatment options that feel "stimulating." The crash associated with giving up Vyvanse is very real, and can lead to intense depression. Because people who crave stimulation and pleasure often become addicted to Vyvanse, a treatment program that replaces your addiction with a healthier "addiction," such as gardening or cycling, is more likely to work. There is a reason you became addicted to Vyvanse--stress, trauma, mental illness, perhaps some combination of the three. Good treatment helps you better understand that reason while accommodating any special needs you might have. For this reason, it's critically important to ask about the specific treatment protocols your program offers. You may also want to visit a session or two, read online reviews, or ask for references. There's no such thing as too much information when it comes to your health. You deserve to know all you can to make the best possible decision. Recovery is far from easy, but it is absolutely possible. If you're willing to admit you have a problem now, your life can look very different in just a few short months. To find out more about Vyvanse treatment and rehabilitation options in your area, call us at 1-888-993-3112Who Answers? to speak to one of our treatment support specialists.